A great place to play tennis - be part of it! 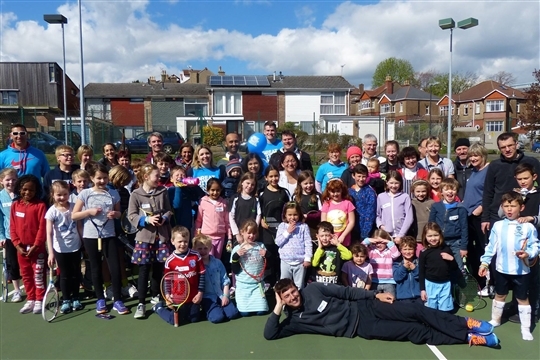 Kings Lawn Tennis Club is a small, friendly club in Bishopston where we welcome new players of all ages and standards. We have seven courts, six of which are floodlit and one of the floodlit courts also has a practice wall. Whether you are new to tennis, haven’t played in years or are an experienced player looking for some competitive action in the league there is something for you at Kings - come and see for yourself. Don't worry if you don't have a racket - we will be able to find one for you so you can try your hand at tennis before joining! Tennis leagues run throughout the year and we are well represented in both the summer and winter leagues, including junior leagues. We have a top class coaching team, who offer group and individual coaching. We enjoy regular social tennis sessions and hold competitions throughout the year; there is also a singles ladder, which is a great way to challenge yourself and meet fellow tennis enthusiasts. The modern clubhouse can be hired for private events and includes changing, toilet and shower facilities as well as a large function room, opening onto a patio area, with a kitchen and bar. We organise social events throughout the year, such as quiz nights, wine tasting, a summer party with BBQ, film nights and of course adult and junior Christmas parties, and we are always looking for new ideas. We also have a projector and a big screen which makes the club a great place to watch major sporting events, with the Six Nations and Wimbledon being particularly popular. See the Events page for full details of what's coming up! If you want to come and get a feel for the club then drop by on a Saturday morning when the 'Saturday Cafe' serves tea, coffee and bacon rolls from 09:30-10:30.